To celebrate the 20th anniversary of Hoffman Estates, the Environmental Commission sponsored a contest to select an official Village flower and tree. Many may not know that we have a Village flower and tree. The announcement of the winners was published in the September/October 1979 Citizen newsletter. 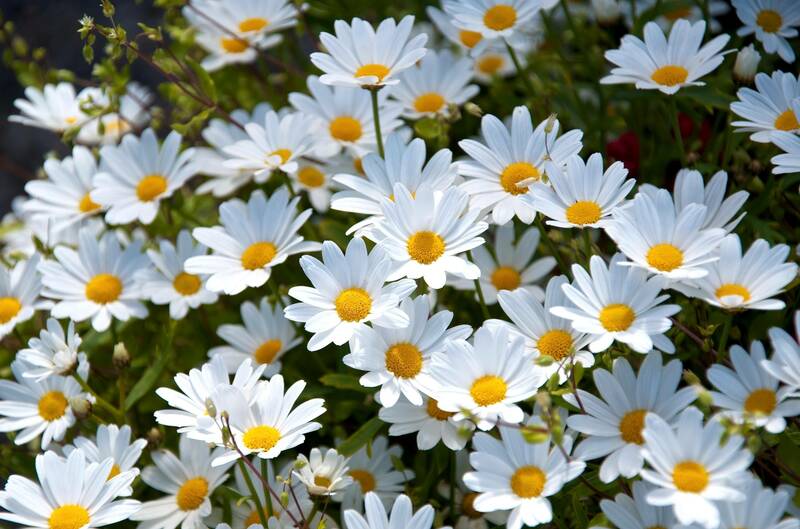 The daisy is one of my favorite flowers. As children we always played the “he/she loves me, he/she loves me not” game as we picked off each petal to learn the truth. I also learned that the daisy represents a new beginning. It certainly is a flower that represents many new beginnings for all the residents of Hoffman Estates. Dave Pivorunas, “ a senior honor student majoring in ornamental horticulture at Michigan State University” felt that the Hackberry tree should be the village’s official tree. The tree is native to the area and has a beautiful cork like bark as well as loads of purple berries that the birds love to feast on in the fall. In doing some research on the tree I found that the berries are edible and have a high fat content that helps birds survive the winter or their migration south. Dave felt that the tree would be the best choice for village tree because, at that time, it was the oldest and largest tree growing on the old village hall property on Illinois Blvd., now the Children’s Advocacy Center. I had to drive over to the old village hall and see for myself if the tree was still there, and it was. It’s a majestic tree, hugging the front of the old Geiske/Hammerstein farm house, shading a majority of the roof and gracefully hanging over the front walk. 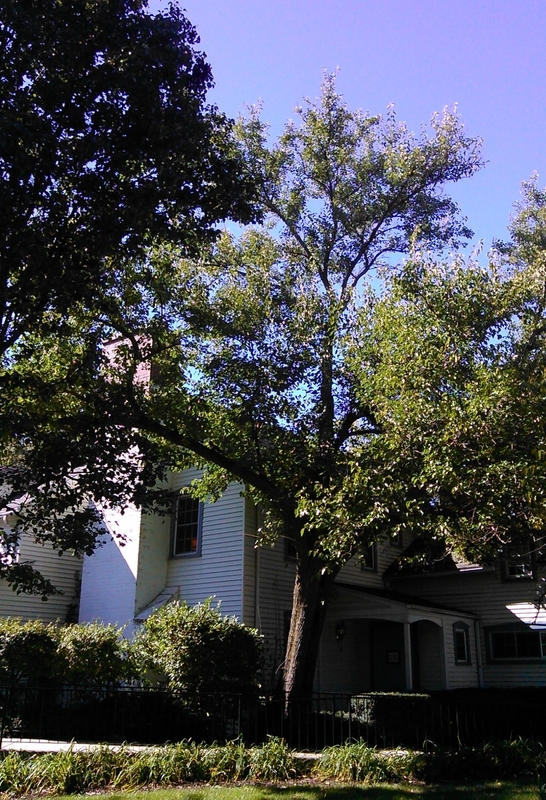 The farmhouse dates back to the late 1840s and the tree could be well over 150 years old. Perhaps in the future, we can consider choosing a village bird since we have more than 4000 acres of park district and forest preserve land within our village boundaries. I can’t even count the number of different bird species that I hear and see in my neighborhood, maybe for our 60th anniversary. Our guest contributor this week is Pat Barch, the Hoffman Estates Historian. This column originally appeared in the November 2014 issue of the Hoffman Estates Citizen, the village’s newsletter. The column appears here, courtesy of the Village of Hoffman Estates. I love trees. Ever since I was a young girl, trees were always special. I climbed in them all the time. I’d go all the way up to the tip top and feel the tree sway from side to side. I guess I could’ve fallen from a lot of the trees I climbed, but I didn’t. 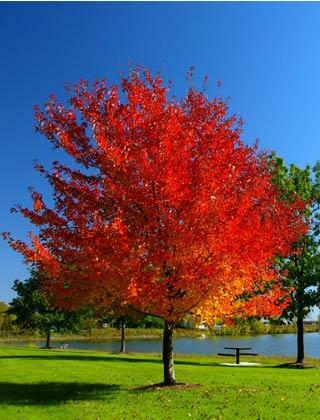 When we moved to Hoffman Estates, I was happy to see trees in the parkway and several trees in my front and side yards. All the trees were so small. Not many leaves to rake in the beginning. In later years it was fun to rake and have the kids hide and jump in the piles. Now my trees, maples and elms, have grown much higher than my home and give the yard and house a cool shade all summer long. When F & S Construction built the homes in Hoffman Estates in the early years, they planted maples. They’re soft maples, some are shag bark maples, and they’ve broken easily in really high winds over the years. We’ve also had years were we had cottony maple scale on our trees. They’ve come through in spite of storms and disease. When they planted the green ash trees in later years, they were wonderful trees. They grew quickly and we loved them. I had one in my parkway and it was a columnar green ash, just the right shape for the parkway. When we had those dry summers over the past few years, I’d be more worried about my trees than my lawn. I’d set out the sprinkler and give them a good soaking. As my trees grew larger, my air conditioner bill grew smaller. The leave raking wasn’t as much fun since the kids were getting older. They were too big to hid or jump in them anymore although the piles were bigger and could have hidden a teenager very easily. The kids weren’t too interested in racking them either. 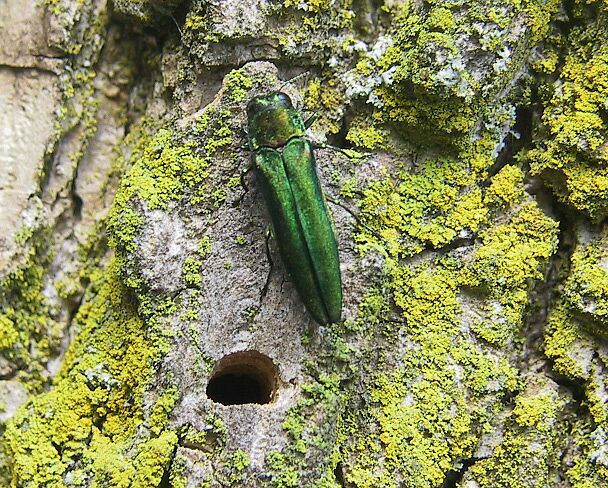 Now as I drive around the village, I’m sad to see all the trees that have been killed by the Emerald Ash Borer. It’s thought that they arrived from China in packing materials. The village has been working so hard to remove the diseased trees. It’s a major undertaking to get new ones planted and our job to care for them. Many neighborhoods will have to wait for the newly planted trees to grow and thrive and once again provide beauty, shade and homes for the birds and squirrels.